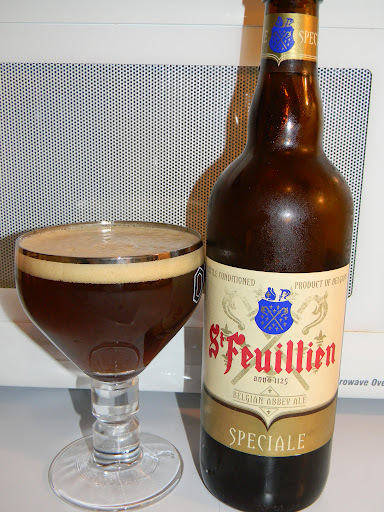 Review of St. Feuillien Speciale | Beer Apprentice - Craft Beer News, Reviews, Interviews and Info. Hi guys. For today’s craft beer review I’m going to be trying the St. Feuillien Speciale Belgian Abbey Ale produced by the Brasserie St. Feuillien located in Le Roeulx, Belgium. I’ve been craving a good, Belgian styled beer for a few days now, so I figured that this one might satisfy my hunger. I couldn’t find any specific information on the website, st-feuillien.com, about this particular beer. I have read that this is the same recipe as the St. Feuillien Cuvee De Noel, but I have no proof of that, so I’m just going to find out for myself what this beer is all about. This beer has an ABV of 9.0% and it was poured from a 25.4 oz. bottle. It appeared to be a mostly clear, burgundy to amber color with some deep orange hues around the curves of the glass. It had a light tan head that was decently sized, kind of fizzy, but smooth. The retention time was so-so and the lacing seemed to be only average as well. The aroma seemed to conjure up hints of freshly picked dark grapes. Additional tones of green pears, green bananas and prunes were in there too. Spicy scents of clove and coriander mixed with subdued yeasty and bready fragrances hid underneath the overall bouquet. The fruitiness was easily the dominant fragrance as it stood slightly above the other characteristics, thus creating a rather unbalanced nose. The taste brought forth somewhat of a tart and acidic grape skin likeness. Tones of cherry and a very relaxed banana added a touch more fruitiness. Again, hints of clove, but this time I also received a very noticeable peppery spice that added a little bit of bite. The flavor did present some bready and yeasty savors, however I didn’t find them to be the smooth, creamy and silky style that some of the “top” Belgians have. They seemed very weak and feeble. I also noticed a relish of alcohol, which when blended with the cherry, gave it a kind of medicinal/cough syrup flavor. Like the aroma, the taste wasn’t balanced as well as I thought it might have been. The mouthfeel was medium bodied, dry and marginally chewy. The carbonation was ok and I thought that a good amount of warmth was felt at the back end . Also, quite a bit of flavor was left on the palate after the swallow. Not too bad in that respect. Hmm. Well…. this beer is ok I guess. I definitely wouldn’t put it up there with the “better” Belgian styled beers that are on the market, but it wasn’t completely undrinkable either. As it warmed the breadiness started to come through a touch more, which helped restrain some of that medicinal flavor and that made the drinkability factor much better. I’ll say that I would have no problem drinking this again if it were offered, but I doubt that I will be picking it up on a regular basis. That’s not to say that you guys wouldn’t like it, but for my money, there are better beers of this style to be had. So, give it a try if you see it and let me know what you think of the St. Feuillien Speciale.